*AED must be in working condition. PADS NOT REQUIRED. AED trade in rebate must be applied towards purchase of new AED. 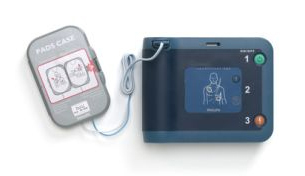 CPR Savers & First Aid Supply offers Automated External Defibrillators (AEDs) as lifesaving devices to treat victims of sudden cardiac arrest. These defibrillators are designed to quickly and easily provide an electric shock that restores the victim's normal heart rhythm. Sudden Cardiac Arrest (SCA) is a leading cause of death in the United States -- accounting for an estimated 325,000 deaths each year. Without treatment, SCA will lead to death within minutes. To ensure the highest chance of survivability, one must immediately call the local emergency number, start CPR, and use an AED. Thankfully, the field of science has made the technology within automated external defibrillators easy to use, accurate, and highly effective. 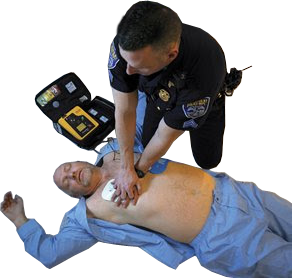 They were designed for those who do not have first responder training, but become that much more effective when coupled with a basic AED or CPR class. A study analyzed the effects of having AEDs immediately present over a two year period. Of the 18 individuals that could have been treated with an AED, 11 survived. Of these survivors, over half were treated by good Samaritan bystanders with absolutely no previous training in AED use. Whether you're buying a personal AED for peace of mind for your family, or buying an AED to stay within regulation for your company, we have the widest selection of AEDs that will fit your specific needs, take a moment to browse our AED Comparison Chart. Because AEDs are considered so important, there may be monetary help available to you through an AED Grant Program. If you have any questions whatsoever as to what AED is best for you or the differences between models, call us at 1.800.480.1277, where our trained service representatives are waiting to answer your questions.